Home > Books > Guess Who? The reader is asked to guess the answers to questions proposed in rhymes and answered in pictures. 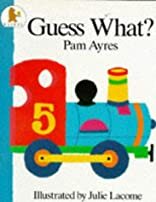 About PAM AYRES (Author) : PAM AYRES is a published author of children's books. Some of the published credits of PAM AYRES include Guess Who, Guess What, Piggo and the Fork Lift Truck.